Alrighty, to spill out the good news, I’ll be going to Perth next month. Yay! 22-30 April, short but sweet I believe. Hehe. #1: In desperate need of break!! Been having lots of quality issues at work, do troubleshooting, disposition, finding rootcause..zzz.. Product engineers are definitely problem solvers! And I foresee busier schedule starting from May onwards for the next 2 years. Thus, this holiday is a NEED! Not on the exact date, p.s. Exact date would be 2 April. Better late than never rite? 🙂 Really looking forward to it! This one year has been wonderful and it’s worth to celebrate. Regardless of what people say about us or about our relationship, we know each other the most. And proudly I could say, we both feel so grateful to have found each other. Oh yea, I’ve been wanting to travel overseas like for years. Reason being is that I came from middle class family, not so privileged as to be able to travel overseas so much. To me, the furthest I’ve been was Bangkok. Sigh. Still, my family is the best in my opinion. They teach me great values like being faithful in small things, work hard, give your very best in everything, prioritize well, spend on essential needs, etc etc. Thanks mom n dad! Now that I’m working, I guess it’s appropriate for me to just travel a little bit to reward myself. Hehe. – Return tix to Perth » Booked! Simple question with no definite answer. As for me, I’ll learn each definition at different occasions in my life. And today, I’ve just learned a definition which struck me deeply. LOVE is a selfless sacrifice to put the need of others even at the expense of yourself. You can deny me all you want, or call me stupid or dumb, but it’s the real thing! People don’t care how much you know until they know how much you care. I have one irregular member who was sick, stressed out and lonely; thus she decided to message me and asking me if I have time to visit her. So there I was, immediately changed all my plans for the night and went to visit her. 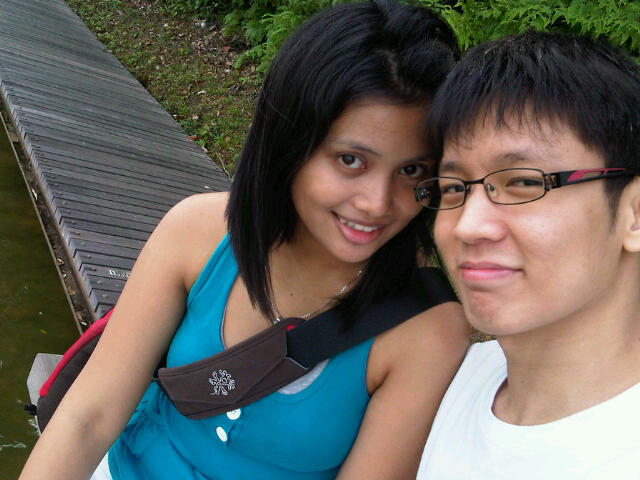 Just a side note, she stays at Toa Payoh area and I stay at Clementi area, quite long distance. During the journey, I kept praying, that God would use me to touch her lives and when I laid hands upon her, that healing power would flow through. True enough, when I reached her house, she was home alone and she was in tears. I was rather surprised, later on she told me that the pain has been unbearable and she could only cry for the past few days. I was speechless. I started to talk to her, trying to understand the whole situation, though I know I might not be able to give her solution. But as we continued talking, I felt that the love of God was flowing in the room and she started to smile and laugh. We talked about lots of things from our childhood, our habits, our interests in fashion, etc. Nothing so spiritual. Throughout the conversation, she kept on saying to me, “Whenever you’re around, I don’t feel sad or pain.” Wow wow! To end up, I prayed for her proclaiming total healing. We don’t know yet her latest condition, but I believe deep inside my heart that our God has the final say. And that he will heal her miraculously. What I’m trying to say here is, we have to look beyond ourselves and stop being so selfish and self-centered. There are people out there who needs the love of God that is manifested through us. And that love will not flow unless we’re willing to be selfless, to sacrifice and put the need of others even at the expense of ourselves. And trust me, surprisingly you’ll feel so happy and contented to be able to share the love with people in need. I do believe in cherishing the little things in life. You may not have lots of money to eat at fancy places, buy luxurious gifts, etc. But if you know the value of things beyond their price tags, you’ll find each moment spent together is priceless. Love ♡ ♡ Sent from my BlackBerry Wireless Handheld from M1. 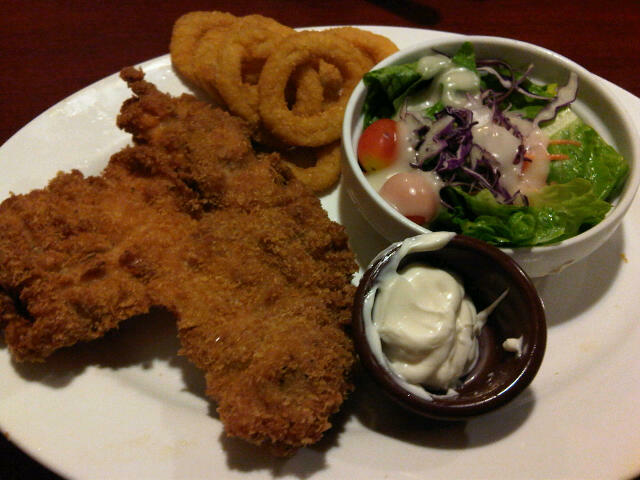 Crispy chicken with onion rings and house salad as sides. Onion ring is not as crispy as usual, and it has certain smell. Chicken was alright, a little bit too dry. The best would be the house salad, its taste is consistent across all branches that serve this. Plus, it’s very fresh and has right combination of sour and sweet. Highly recommended. Okie, off for work again now. Cheers! Sent from my BlackBerry Wireless Handheld from M1. Sending my dear off to airport today. I did cry, but a little, guess I’ve grown up a little too! Thinking that it won’t be that long of a separation and that another 3 semesters till he’s back here with me; definitely cheers me up. My prayers go with you baby! Remember, you’re never alone, God is with you. Go there and make God, your family and me sooo proud!